Starting from April 1, 2010, if your total income falls under any of the taxable slab, you are required to quote Permanent Account Number (PAN) in your financial transactions. Budget 2009-10 makes it mandatory to quote your PAN number in all correspondences with the tax authorities, a step taken to enhance transparency in the transaction and to ensure avoidance of tax evasion. It is now mandatory for a taxpayer to quote his PAN number in the tax returns, bank deposits exceeding specified limits and mutual funds above a certain value among several other transactions which may demand PAN number quote of the party to the transaction. Starting from FY 2010-11, Income Tax (IT) authorities could impose up to 20% of tax deducted at source (TDS) if the recipient of the income (including non-residents) fails to provide his PAN to the related deducting agency. Currently, the regular rate of TDS under various different income heads ranges from 2% to 10%. If you do not furnish your PAN number – while filing the return or to the source of income deducting agency – you may now have to cough up to 20%. The aim of the authorities, behind making PAN quote mandatory, is to ensure diligent disclosure and transparency of transaction on behalf of the tax payers, so that they can not render any unknown transaction as a secret which undergoes a tax-evasive step. The IT department has made it mandatory for employers to quote PAN of their employees while filing TDS returns. Usually, an assessee pays tax in the assessment year on income earned in previous year which calls for a delay until the completion of the previous year. And, hence, TDS is deducted, at the source of the income itself, to recover such amount much earlier on certain notified nature and/or value of transactions such as Salary, Rental fee, Commission, Interest, etc. 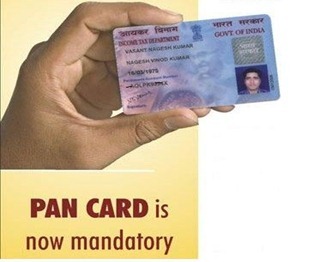 If you do not have a PAN card as yet, its high time you do ! hi , you know people easy get into a trouble and go in the wrong way for pan card word , its so easy When you entering Pan name, you enter your name and middle name without any spaces.And also you check your pan card status by entering PAN card number from Pan Card Verification …. hope so you will get what you you need. I lost my PAN Card, how to get duplicate thereof. you can apply a duplicate copy of pan card for the same pan no. along with the document in which u get the lost pan no.like (voter id,residential proof).And submit these with an agent. iam a housewife , i was having a pan card with incorrect DOB . i want to correct it . i donn’t know what to do and apply for a fresh pan card . now i got a new pan card with new number recently . but someone told me this is illegal . is it so . if yes tell me what i do now . how can i surrender my new pan card and do correction in previous pan card . i would like to know wheather there is a TDS on contractor rule for state of sikkim ? if yes than it is like other state of india only. thanks viral for the prompt reply..yes, he needs my PAN no to qoute against my salary slip and have shown him the acknowledgement of the PAN application, but still he doesn’t give an reply and says that my joining would be counted from July and refuses to pay it with the month of July. is he correct? HR also doesn’t have a say in this due to unawareness of the correct rules. I have heard that generally companies keep the salary on hold in such situations, but it is not happening in this case.. please guide me. Firstly, I’m not an expert on this issue, as I’ve never been an employee in any firm before. So, don’t take my suggesionts on its face value, take it with a pinch of salt. Secondly, logically, as far as I understand, you’ve served your company for the whole month of June, so you’re entitled for your salary for that month. If your problem has not been redressed by the immediate people responsible for it or for that matter even HR department, knock the doors of senior management of the company directly, reach out to them personally. Thats what I do, when I’ve some problem in banking transactions with my banker. First, try to resolve my query with usual staff. If I’m not satisfied, I directly reach out to the bank’s Branch Manager. You’ve to take initiative to reach higher management. Don’t forget to take your PAN card application acknowledgement & other requisite documents while reaching to the higher management so that you dont waste their (and your own time too) time. I joined my company on 1st june and had applied for a pan card, but am yet to get the pan number. But, the office accountant says that i wont be getting any salary for june. anyone aware of the rules can tell me whether he is right or wrong? shudnt i get my salary for june clubbed with the pay of july? Is it that your office accountant is denying you salary for the month of June saying that – they need your PAN number to quote against your salary slip? If yes, you can produce a copy of your application of PAN card as a proof that you didn’t had PAN number then, but you had applied for the same. So, preferably, your office should accept your application copy until, of course, you receive a PAN number for yourself. my name is tenzing lama. and i am from sikkim….i recently joined american express ,gurgoan on the 26th of april 2010.Now we do not pay income tax in sikkim,and i have no pan number.I have came across this notification today and the employer did not inform me about this incident.My question is is it possible that my salary will not be deducted at 20% at tds……if i am what is the procedure to reedem the money….thanks.. Ops!! they are trying anything and everything. But jokes apart this is a good move and also now a days PAN number are issued promptly by NSDL and UTI so no issues! !